For a while now, I've been meaning to repost a popular entry about my philosophy of "Style Soup" that I had living on my previous blog. Imagine my surprise when I realized it was first posted January 1, 2014. Three Years Ago. It is probably my favorite blip I've ever shared, and I got some wonderful comments back from readers, so it only seemed fitting that I have it here on my current website, too. Enjoy! Many students and colleagues that I know mention the struggle of finding their "style" and the uncomfortable growing pains that come with it: fear, doubt, and confusion. They are worried about venturing too far from their comfort zone or "being all over the place" when they experiment with new artistic influences and interests. One of the best ways I like to explain how visual styles come together is by using the idea of "Style Soup". When making soup, you take several ingredients and throw them together in a pot. The important thing is to give it a lot of time to cook. If you let it sit there for 5 minutes and then taste your soup, it probably won't taste very good, right? Let it cook all day and you'll have something delicious! Same thing with your own style- it takes a while for different interests and influences to meld together in your own way. This is how you can be interested in seemingly very different things (say, Renaissance painting and contemporary animation) and have it work for you. The challenge is to be patient. I'll take this moment to point out that this "Style Soup" will give you a much richer point of view. Too many times people see something they like and say "I like that. I want to make art like that", and stop there. Instead, you should really be thinking "I like that. What in particular do I like about it? Compared to other things I like, are there similarities that point to my personal visual aesthetic?" Let's take an example and see how different artistic fields and eras have influenced my work. I'll start by introducing some artists to you. You've probably heard of some while one or two might be new to you. I was introduced to Yoshitaka Amano at a very early age when I obsessively watched my brother play the Final Fantasy video games. Amano has done concept design for all of them as well as worked on several other Japanese titles, such as Speed Racer and Vampire Hunter D. In the meantime, he shows his paintings in galleries across the world. His work highlights qualities of Japanese woodblock prints and art nouveau, both sharing visual elements such as an abstracted sense of space and graphic, bold use of shapes and pattern. Swiss artist Giacometti is best known for his elongated sculptures of the human figure, but his paintings are equally as explorative and full of texture. By the time he passed away in 1966, he had reached international fame. He preferred to use family members as his models, and I've always loved how direct yet intimate his portraits appear. With mid 20th century art and culture blowing up recently, Mary Blair has become even more popular. As a crucial concept artist for Disney on classic movies like Alice in Wonderland and Peter Pan, she also has gained recognition for her role during a time when women were not seen in such crucial positions. Like many artists of the period, Blair pulled from influences such as folk art, which influenced her use of bright (sometimes unorthodox) color choices, use of iconography, and graphic compositions. In addition to working for the Big D, Mary Blair led a successful life as an illustrator producing children's books and numerous advertisements featuring her whimsical style. It's amazing to see how trendy and fashionable Schiele's paintings of women seem today, even though they are about a hundred years old. An Austrian painter and student of Gustav Klimt, his more provocative work actually landed him a brief stint in jail after being deemed pornographic by local officials. His work finally gained popularity before his untimely death at the age of 28. Focused on the human figure, his paintings are full of energetic linework and paint strokes. 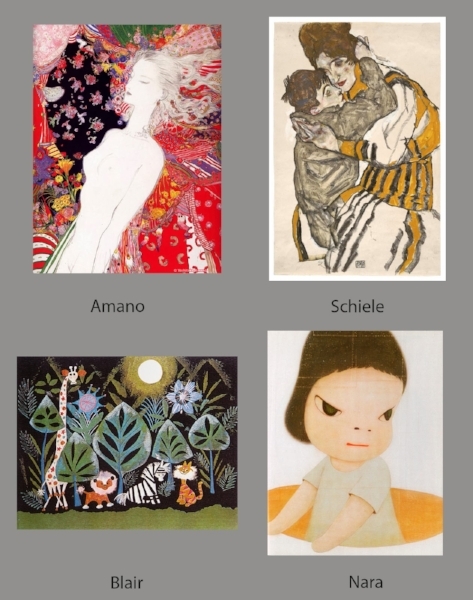 Chances are you have come across Nara's delicate and somewhat mysterious paintings of feisty girls and animals in the forms of books or postcard sets somewhere. Born in Japan, Nara sites pop culture as a heavy influence in his large paintings and sculptures. Currently his work is shown in galleries around the world and is also licensed on everyday products you can find in specialty stores. Whereas some of these you can probably see connections right off the bat, other images may seem very different at first glance. But, are they??? When you really break down the elements of each artist, many of them overlap in their stylistic choices. All of these artists design their compositions by activating the space more with color, negative space, and pattern rather than realistic or naturalistic environments. Hand-lettering pops up as a design element, and things are heavily stylized or become icons rather than needing to be realistic interpretations, like Blair's flowers or Nara's girls. Probably one of the more obvious connections between these artists is their focus on unique characters and the impact they have on the viewer. Since space and figures are being abstracted by these artists, naturally color is also being abstracted, too. It's in these visual worlds that colors are chosen more for their design sense rather than what's actually there in reality (resulting in blue skin or a pink sky, for instance). Whether it's bold and high-constrast...or delicate and very limited, color is used in unexpected ways. Finally, we see how these artists create interest through texture and pattern. Blair and Amano's pieces are full of pattern, which in itself creates texture depending on the size and nature of the pattern(s) used. Schiele, Nara, and Giacometti's work all feature wonderfully raw texture created by brushes and various mediums. Many times these two elements can be one in the same, with Schiele highlighting the bold print of a woman's dress or Giacometti's strokes turning into a pattern of vertical and horizontal lines as he sketches out the details of a room that his model is sitting in. In conclusion, when you are able to dissect the pieces you are attracted to, you start to see little connections that reveal more about your personal style. From these artists that I have grown up with, I know that I like character-based images with stylized environments directed more by color and pattern rather than a literal/realistic environment. You can start to see how these things influence my work when you take a second look. Let me point out that it took me a while to see these connections. However, over time I eventually got there (remember earlier when I said time was an important factor in this process?) With each piece of art completed, you get one step closer. A little different, huh? You can see I love characters and am playing around with how to handle the rest of the composition. There are also different takes on stylizing my characters- some more simple and cartoony, others more rendered. I will end this post by saying that I believe your style is like your sense of taste: it matures, grows, and is constantly evolving. Remember that this process is about discovery. It's an adventure. Try new things, take a class once in a while, or just play around in your sketchbook. And have fun! Thanks for reading.